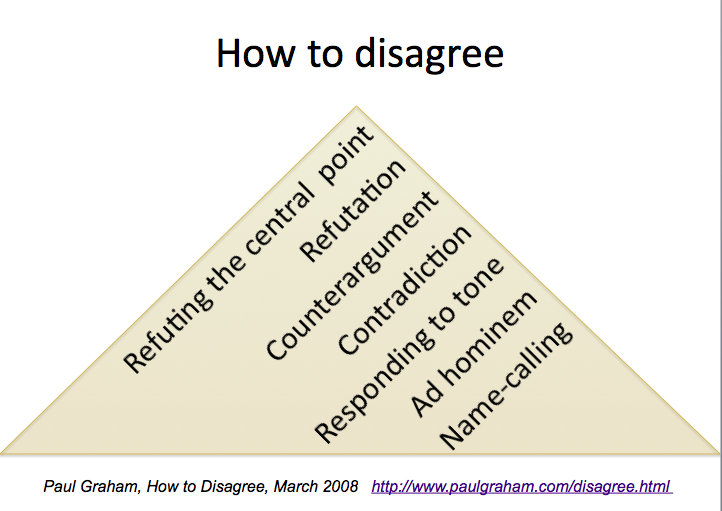 Then I showed them Paul Graham’s great “pyramid of disagreement”, from the lowest, and least effective, ways (name-calling, ad hominem attacks) to those that promise most in every respect (refutation, and especially refuting the key argument). That article is well worth reading (Paul Graham, How to Disagree, March 2008). A stress-reduction game: The player moves through various environments where she makes healthy, fun, vitalizing choices to move from 100% to 0% stress. An urban life game: The player moves through urban adventures, where he has to “do the right thing” and is awarded citizenship and other bonus points and can become mayor or similar. An end terrorism game, where the player has to put together a team to end terrorism (a lawyer, a general…). Each profile has a different chance of success, and this is predefined, so depending on whether the player employs the members of the team the way the designers have determined them to be successful, the mission will succeed. An end organized crime game, in which players gain the necessary resources, which they then use as they try to infiltrate the criminal networks in missions, distracting and entertaining them to get inside. After this entertaining activity, the students went on to “take a stand”. I showed them a cartoom that’s been making the rounds (“Dad, I’m considering a career in organized crime.” “Government or private sector?”) and asked them “Which sector is more corrupt?” The more outspoken in the class stood and spoke, and responded to each other with counter-arguments. They were great, and this I filmed, but unfortunately at over 13 minutes, the film is too long too share. (I have to break the film down to upload to our private channel, but this always takes time.) In a second round, everyone paired up, and one player expressed a standpoint, to which the other responded by agreeing with certain parts of the argument and disagreeing with others. This gave the less outspoken ones a chance to speak. We didn’t get around to the big two team debate I had set up to end things, based on two groups, each reading only one side of an argument, and then engaging in debate, as the above activities took up the full three hours. One thing that is rarely successful in these types of lessons is to get students to actually use functional language. I did hand out respective phrase bits and modeled them, but I didn’t actually give positive feedback when I heard them being used. The most effective feedback, I think, is when they are grasping for words and then get, from their peers or from me, the correct phrase (Comprehensible Output). I heard lots of that going on. But in my experience, as I say, it’s rarely the language usually defined as functional, it’s usually the words that carry more content. These students are using English as a Lingua Franca (ELF), at differeing levels of fluency, and they are collaborating towards an outcome, very successfully. I don’t think it’s wrong to point out functional language, it may ring a bell with some of them and come in handy, but I don’t believe in pushing it. 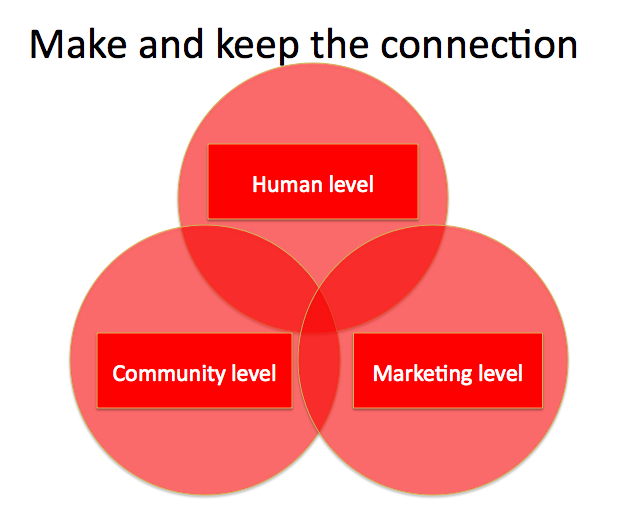 I think it’s far more essential to internalize the principles of good communication, and that’s why a bit of a presentation and discussion of those, followed by loads of communicative activities to practice and get routine, is my favored approach. What I need to improve next time I do this sort of thing is to make sure there is a feedback slot at the end to revisit those principles. Here is my presentation as a pdf. If you have done or do anything similar in classes, I’d love to hear from you! His videos are lovely, aren’t they? He focusses on the concepts behind the phrases, rather than on just the phrases. One of our next workshops in Berlin is going to be by Vicki Hollett, which is thrilling. In her preview she promised she’ll deal with functional language. This is going to be interesting. I was thinking that to get students to use functional language properly to achieve their aims, I’d really need them to pair up with native speakers, or with those who simply don’t react as well unless they hear the functional key phrases used. My students get along fine without them, amongst themselves. Nice to hear from you – good for you having Vicki Hollett – great lady. Is that run by Belta – is there a Belta? B.t.w, did you know Michele (DuttonCox)? Did you know she passed away – it was around Dec. 7, I miss her terribly. Speaking of functional key phrases etc. perhaps you could throw in some examples of ones you find essential (?) You know how Mark Powell says we teach the ‘language of meetings’ but nobody in real life uses this kind of language – d’ju know what I mean? OMG, of course I know or knew Michele, from the MELTA events, and most vividly from the Christmas parties. She had the most amazing earrings, red and purple Christmas balls, and was so full of life. Unthinkable that the life should have gone out of her. I didn’t know her well myself, but I’m really sorry you’ve lost a friend. Hang in there. Here the teachers’ association is called ELTABB (Berlin-Brandenburg). Vicki Hollett is coming, but the venue hasn’t been finalized, so the happy event isn’t being advertized just yet. Weird. Functional language matches the context of a given type of communication, right, so for example when the students were collecting reasons they could have used the language of coordination (and, also, another). We might say like “as well” and “not to forget” and “in addition” and “And then there is always”, but those words didn’t come up much. Instead, most of them just said “Also” and added their reason. But the fact that their functional language was simple doesn’t mean that they introduced every new idea the same way. Facial expression, body language, tone of voice, hesitating and stopping in mid-sentence, deferring, nodding, … that’s eloquent in nonverbal/paralinguistic ways. Another task had them discussing and arguing and in fact disagreeing with each other and finding a consensus or just letting differences pass to achieve a goal in a set period of time. That’s the type of context where Mark Powell makes fun of the “Language of Meetings” syllabus, right, and where we teach hedging and fuzzy language and polite noises because most English native speakers use them. But really, the students know that to achieve their goals they have to avoid face-threatening acts to keep the work group whole and focused on a common outcome, so they use all sorts of strategies. We made one explicit, responding to a point by first agreeing with certain parts and then disagreeing with others, and they pretty much all took to that right away. I’d have to record them to log the exact words they used to switch from acknowleding the other person’s point to expressing disagreement, but my impression was that they used relatively simple verbal pivots starting with “but” (“but you can also say” “but there is another side”), all very straightforward and explicit and yet unthreatening, due to that strategy of agreeing first. In another lesson, if we had the time, the students could listen to/ analyze how others are hedging and using fuzzy language in an unscripted debate as a video. But how much uptake is there going to be? I’m very curious about what kind of language Vicki Hollett will suggest teaching. I would appreciate any information you might have on Michele. We worked together at Digital from 1981 through 1983. Her work as an English teacher (outside of her day job) was her true love. I last saw her on a visit to Munich in December 1992. She had a unique life spirit and love of life. You might want to try getting in touch with Joan (who left the comment above) through the MELTA website http://www.melta.de/aboutus_committee.php.